Zyvana is an ancient Cypriot recipe which as been used for 100's of years and passed down through many generations. This mystical and totally natural massage oil has been known to assist with many different ailments. NATURALLY FRAGRANCED AND HIGHLY CONCENTRATED. 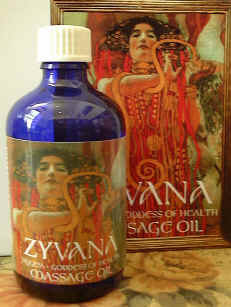 ZYVANA INGREDIENTS: Ancient Cypriot Grape Extract, Eucalyptus & Lavender Pure Essential Oils, Sweet Almond, Soya Bean, Wheatgerm, Jojoba, Rosehip, Vitamins C & E.
DIRECTIONS FOR USE: Massage Zyvana over any area of the body, diffuse in an aromatherapy burner, add to bath water, apply to cuts or cold sores, put onto a handkerchief and inhale when required. which this ancient Massage Oil offers. You won't believe it until you try it !!! SHOWN ABOVE: Hygeia who appears on our label, is the Goddess of all healing of body, mind and soul.